The design at Reservoir, inside the trendy Arrive hotel, brings Palm Springs’ mid-century aesthetics into the present day, with a contemporary palette of exposed knotted wood walls and succulent-clad tabletops. The kitchen and bar are open late (a rarity in early-to-bed Palm Springs), serving Mexi-Cali fare like guajillo mushroom cheese crisp. Order it alongside a lengthy mix-and-match taco menu highlighting fresh, seasonal ingredients. Plus, refreshing pool party-inspired cocktails, like the Swan Dive with cucumber vodka, grapefruit, and lime, are served up just a few steps from the pool. So.Pa is what happens when a casual courtyard setting collides with elegant living room décor. Hidden inside the L’Horizon hotel, all of the seating at stylish and intimate So.Pa is alfresco, with cushy booths and outdoor sofas illuminated by firepits and and glass mid-century chandeliers. The menu offers a twist in technique to traditional California-Mediterranean dishes—whole roasted olives arrive sprinkled with feta to be spread on a charred triangle of levain and something as simple as the sea bass means the crisped skin and lemongrass-shitake broth is elevated from predictable to unforgettable. Here the food is meant to rise to the occasion of the design, with plates serving as the canvas, incorporating texture, color, and flavor. 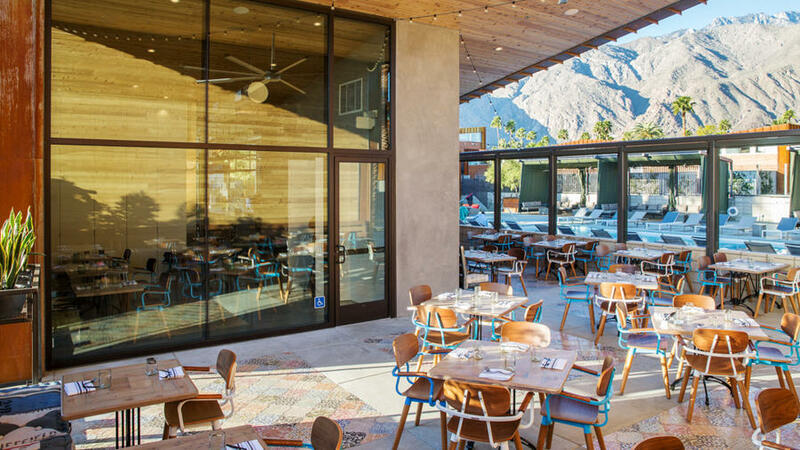 The owners transformed a 90-year-old movie theater into a James Beard Award-winning restaurant for design, fittingly situated on the edge of Palm Springs’ burgeoning Uptown Design District. Don’t miss favorites like the rustic pork terrine with poblano ferment and Texas redfish with crispy guanciale and tomato confit. 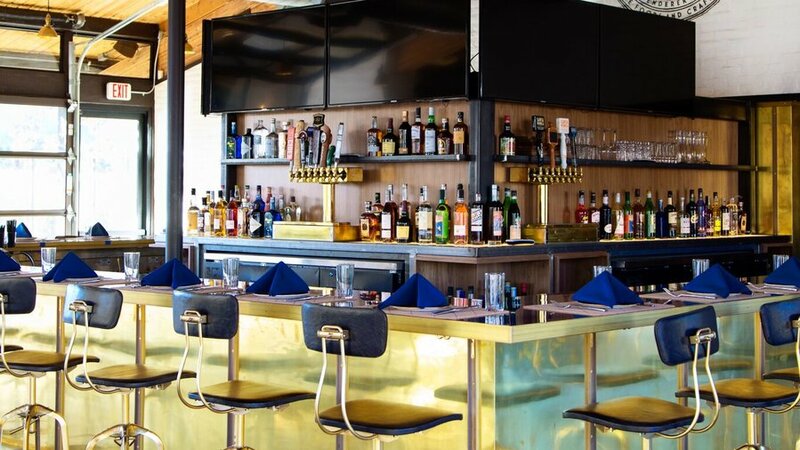 This local’s spot would fit right in just a couple hours west in Silver Lake, but instead it’s hidden in a Palm Springs strip mall on Indian Canyon Drive. 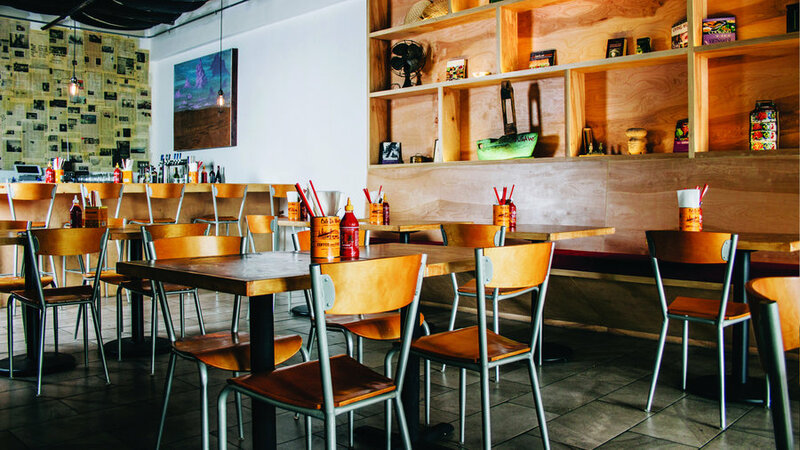 Inside, creative riffs on Vietnamese classics are served amid blonde tables and a showcase of Sonoran Desert and Asian antiques, as well as newspaper wallpaper. Locals swear by the pork belly and trumpet mushroom fried rice and the crispy cod with turmeric and dill. Pair it with a craft cocktail. 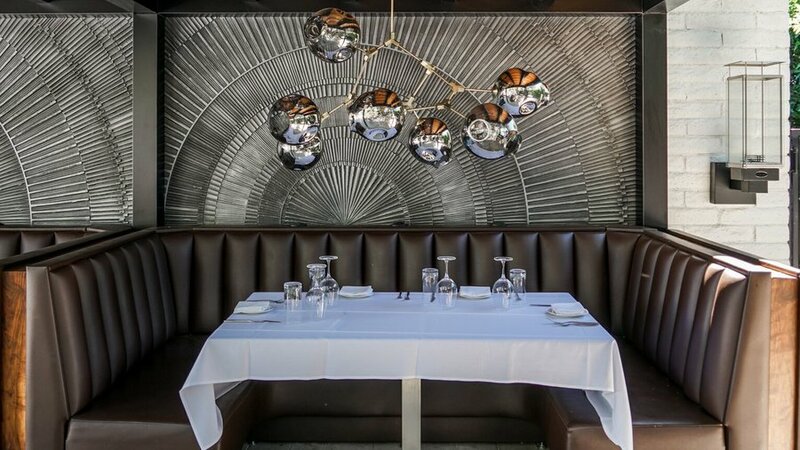 Dinner at this classic Palm Springs restaurant is like getting the Sinatra treatment. The handsome steakhouse serves hand-cut meats—from juicy petite filet mignon to sophisticated bone-in ribeye—and well-balanced classic cocktails garnished with herbs are served amid plush mint-hued banquettes, wood paneled walls, and modern light fixtures. The bar is primed for Manhattan enthusiasts and lounge menu fans. Elevated pub fare reigns here. Riffing on a sports bar theme, it's fitted with high-def TVs but also high design à la Palm Springs millenial starchitect, Chris Pardo—and is an ideal spot for casual refuge between architecture tours or pool party-hopping. 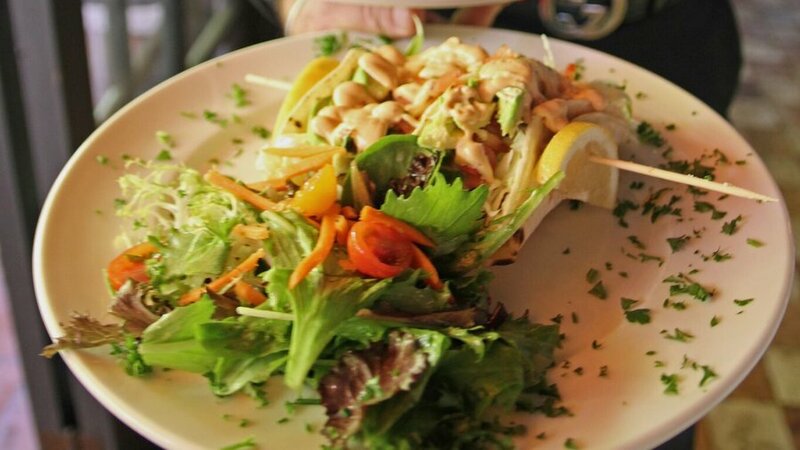 Enjoy asparagus “fries” and French onion soup thickened with Guinness on the wraparound patio, then join in a game on the bean bag toss court. 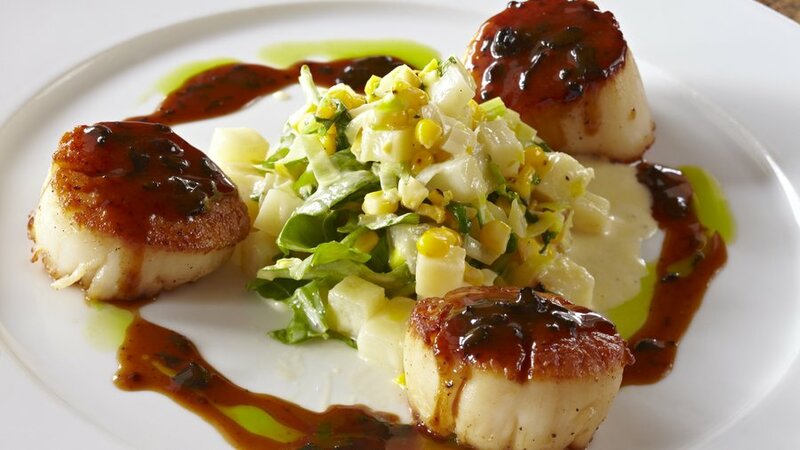 The Old World French fare served in this Mediterranean-style garden patio is Palm Springs fine dining at its best. 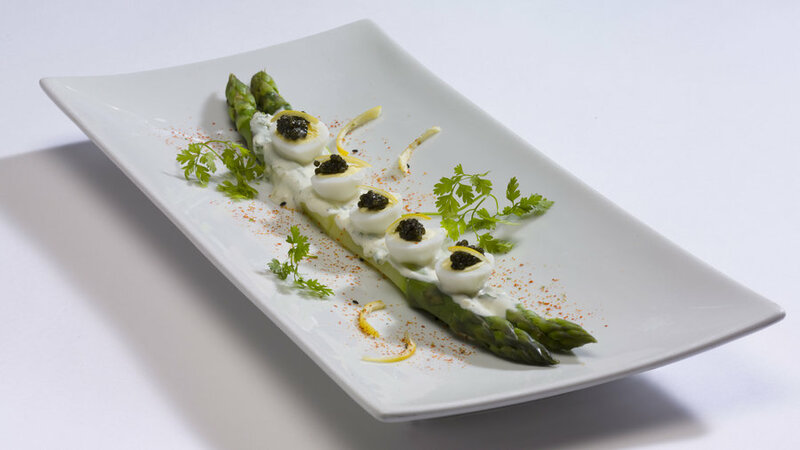 Dishes like roasted tomato terrine with feta and pickled onion or perfectly-crisped grilled octopus with saffron aioli arrive artfully plated and served in a romantic setting, whether you choose to eat on the ficus-lined patio or in the stately interior with Louis XV-style furniture and Flemish tapestries. Have chef envy? Join one of their cooking classes. This warm, romantically-lit dining room is filled with midcentury bright still-lifes and modern tableware. 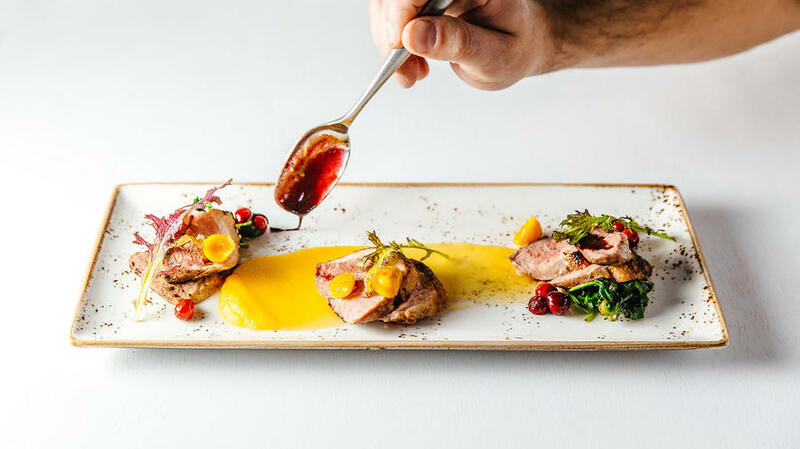 Hailing from Austria, the chef brings with him flavors of his home country, including a section devoted to inventive spins on the wiener schnitzel. Other dishes, like cheese spaetzle made with house-made noodles and gruyère or pretzel with horseradish-crusted pork chop, pair perfectly with the thoughtfully-curated wine list. This delightfully kitsch restaurant in downtown Palm Springs serves up an inspired, slightly healthier spin on the traditional greasy spoon hangover brunch (think Brussels sprouts croissant with scrambled eggs and white cheddar). 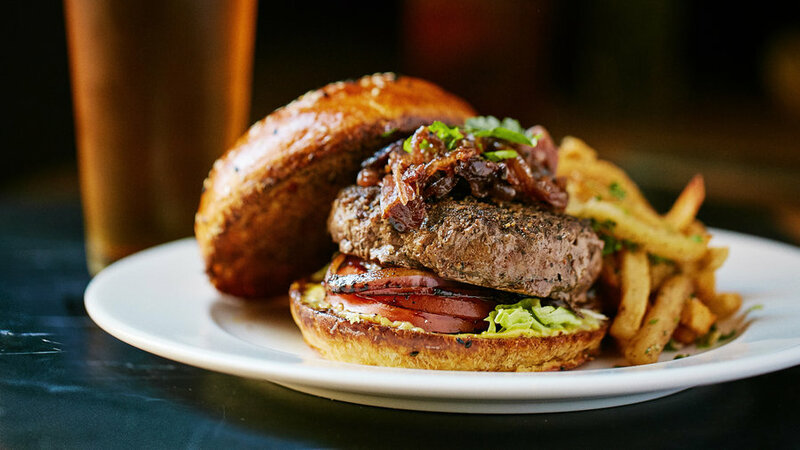 A devoted following floods their social sunny patio on weekends for fresh-squeezed juices, homemade pastries, and a bacon flight that arrives in flavors like miso, date, and jalapeno. 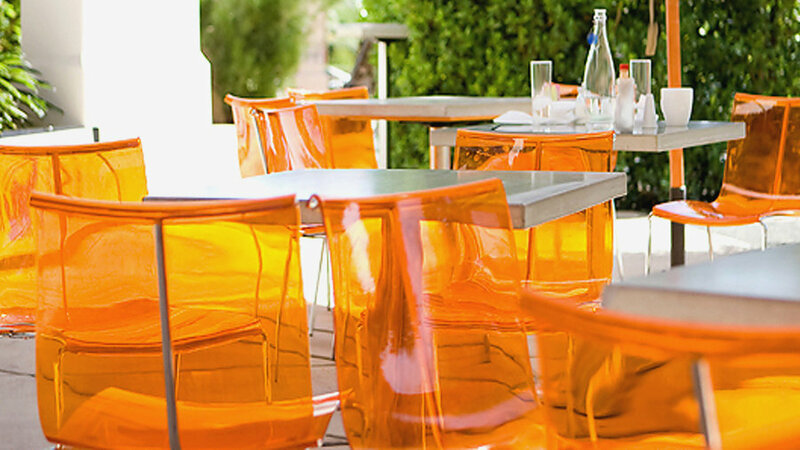 The hardy brunches at this classic American bistro help to kick off a day in the desert, serving creative renditions of bloody Mary’s, mimosas, and bellinis (our vote is for Jake’s mimosa—sparkling wine, clementine vodka, and blood orange juice). Pair one with the croque Benedict—egg-dipped grilled ham and cheese on sourdough topped with two sunny-side eggs and hollandaise—served in a sunny Art Deco interior courtyard.